The third-ranked Gonzaga Bulldogs raced to a 20-0 lead in their latest blowout win last night, but the Zags saved the best for last for their adoring fans. Domantas Sabonis, the freshman sensation who is projected to be a 2015 first-round draft pick by NBA draft guru Chad Ford of ESPN, flatly declared that he will not turn pro after the season. 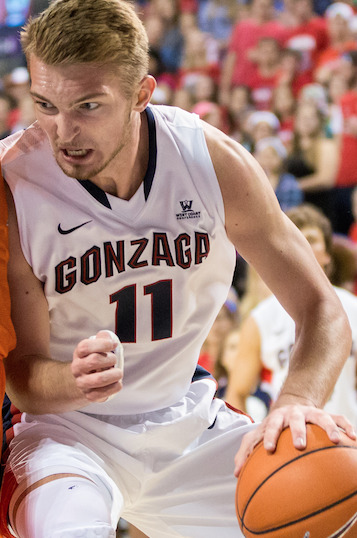 “Not this year,” Sabonis said after the 80-51 rout of Loyola Marymount. “I think I’m not ready. I still need to develop my game in many ways. Sabonis, the son of Hall of Fame center Arvydas Sabonis, leads the 25-1 Bulldogs with 7.2 rebounds per game despite the fact that he doesn’t start. Sabonis averages 21.8 minutes and 9.9 points and shoots 70.2 percent from the field and at the free-throw line. His offensive game is limited largely to a dazzling array of drop-step moves. The 6-foot-10, 231-pound Sabonis was the first name Loyola Marymount head coach Mike Dunlap mentioned when asked about Gonzaga’s NBA prospects. Dunlap, a former NBA head and assistant coach, said senior guards Kevin Pangos and Gary Bell Jr. and junior center Przemek Karnowski also would be “evaluated” for this year’s draft. Dunlap did not include Gonzaga scoring leader Kyle Wiltjer (16.5). A 6-10, 240-pound junior forward with a nice outside shot, Wiltjer led all players with 21 points and 10 rebounds Thursday. Wiltjer and Pangos are on the current 20-man Watch List for the John Wooden Award as college player of the year. “Wiltjer’s not ready for the NBA at this point,” Dunlap said. Sabonis, Pangos and Karnowski are the only Bulldogs that ESPN lists as prospects for the 2015 draft. Sabonis is ranked 29th; Pangos and Karnowski did not make ESPN’s top 100 list. Bell, long recognized as one of the premier defensive players in the West Coast Conference, went through a shooting slump earlier this season. The former Kentridge High School star averages a career-low 8.2 points, but Bell and Pangos (12.0 points, 4.9 assists) routinely pass up shots for the good of the team. “Bell does a lot of things that go unstated,” Dunlap said. The same can be said for many of the Bulldogs. Gonzaga, riding an 18-game winning streak, leads the nation with 52 percent shooting from the field and has outrebounded 24 of 26 opponents. On Thursday, 19 of Gonzaga’s 26 field goals came with assists.